Take some time today to explore the Col. Arthur L. Kelly American Veterans Oral History Collection, which includes interviews with veterans that have served in World War I, World War II, the Korean War, Vietnam, and wars in Iraq and Afghanistan. Visit the Louie B. Nunn Center of Oral History website for more information. 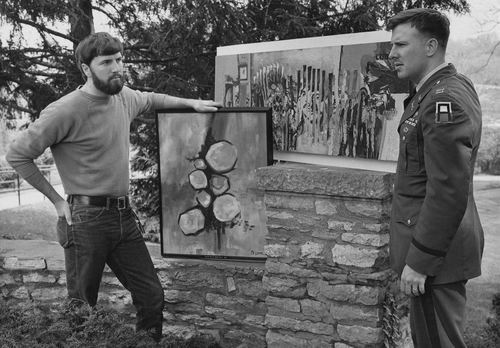 Above: Channon, Captain James B., Professor, Military Science, pictured with fellow Vietnam veteran and University art student Mike Lane (left), both displaying their paintings, which were part of an exhibit at Turfland Mall (Lexington),1968. From the Portrait Print Collection. 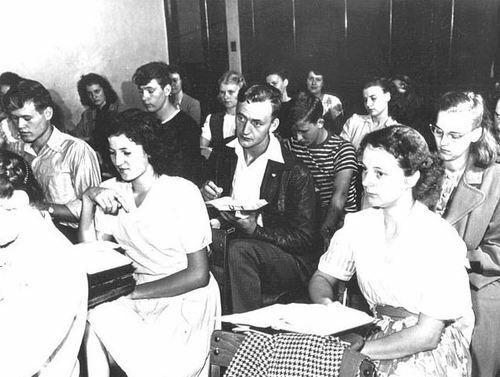 Above: Typewritten label on back of photograph: “Class in high school which George Fain (center), son of Harry Fain, attends. He is a veteran who is in his last year of high school, and hopes to go on to the university.” 1946. From the Russell Lee: Wheelwright, KY Photographic Collection.